While Russia isn't as large as it once was, both in size and stature, that doesn't mean there aren't investment opportunities within the country. 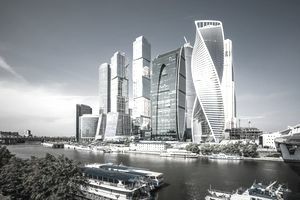 Russia ETFs can be used to diversify a portfolio needing some international exposure, hedge any country-specific risk to Russian investments like changes to Russian law, or even be used as a currency or interest rate play on the Ruble. One of the best advantages of ETFs is the ability to enter certain markets (like Russia) without loading up on equities or battling index basket pricing. Instead, you can get instant exposure to Russian markets with one easy transaction. So for those who have a need to invest in Russia, an ETF might make sense. Unfortunately, there aren't a plethora of Russian funds to choose from, but this list may grow over the years as foreign ETFs gain popularity. And while this list of Russia ETFs is short, investors can consider BRIC ETFs for exposure to Russia as well. This should have you covered for any investing strategy you want to utilize with Russian exchange-traded funds. Also, take note that two of the funds on this list are triple leveraged ETFs (RUSL and RUSS). And of those two funds, one is also an inverse (short) fund—RUSS. Be extra careful with those funds, as they are not for those with weak stomachs and are more for advanced traders with complex investing strategies. For a full list of funds targeting specific countries like Russia, look no further than the List of Country ETFs. You can also consider BRIC ETFs, which not only include Russian assets and ETPs, but Brazil, China, and India as well. The BRIC region covers Brazil, Russia, India, and China (ergo the acronym). While there are specific ETFs for each of these countries, BRIC ETFs have become popular over the years. BRIC investing originated because the four countries were similar in size and economic status and considered to be emerging markets. And while that has changed over the years, it is still a popular grouping for investors—especially ETF investors. And as with any investment, mutual funds, a company stock, an ETF, Index or otherwise, please make sure you thoroughly research this exchange-traded fund or any financial asset before making any trades (long or short). Conduct your due diligence, watch how these funds react to different market conditions, take a look under the hood and see what is in the funds. If you have any questions or concerns, make sure you consult a stockbroker, a financial advisor, or another financial industry professional. While ETFs have many advantages, they have many disadvantages as well (as does any investment). So, it is very important to understand the investment vehicle before you trade it. But, once you have a full understanding on these ETFs, you can consider adding any or all to your portfolio. Good luck with all of your trades!